Icebergs along a fjord near Ilulissat in Greenland are melting. Between Greenland, Antarctica and Alaska, melting ice has raised sea levels about one-fifth of an inch in the past five years. More than half of the loss of landlocked ice in the past five years has occurred in Greenland, based on measurements of ice weight by NASA's GRACE satellite, said NASA geophysicist Scott Luthcke. NASA scientists planned to present their findings Thursday at the American Geophysical Union conference in San Francisco. Luthcke said Greenland figures for the summer of 2008 aren't complete yet, but this year's ice loss, while still significant, won't be as severe as in 2007. The news was better for Alaska. After a precipitous drop in 2005, land ice increased slightly in 2008 because of large winter snowfalls, Luthcke said. Since 2003, when the NASA satellite started taking measurements, Alaska has lost 400 billion tons of land ice. 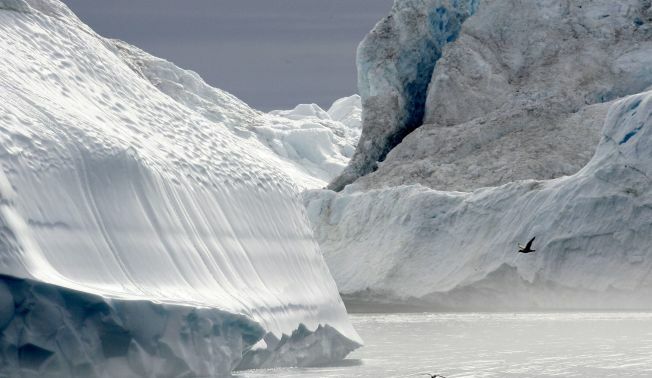 Melting of land ice, unlike sea ice, increases sea levels very slightly. In the 1990s, Greenland didn't add to world sea level rise; now that island is adding about half a millimeter of sea level rise a year, NASA ice scientist Jay Zwally said in a telephone interview from the conference. Between Greenland, Antarctica and Alaska, melting land ice has raised global sea levels about one-fifth of an inch in the past five years, Luthcke said. Sea levels also rise from water expanding as it warms. "It's not getting better; it's continuing to show strong signs of warming and amplification," Zwally said. "There's no reversal taking place." Scientists studying sea ice will announce that parts of the Arctic north of Alaska were 9 to 10 degrees warmer this past fall, a strong early indication of what researchers call the Arctic amplification effect. That's when the Arctic warms faster than predicted, and warming there is accelerating faster than elsewhere on the globe. As sea ice melts, the Arctic waters absorb more heat in the summer, having lost the reflective powers of vast packs of white ice. That absorbed heat is released into the air in the fall. That has led to autumn temperatures in the last several years that are six to 10 degrees warmer than they were in the 1980s, said research scientist Julienne Stroeve at the National Snow and Ice Data Center in Boulder, Colorado. That's a strong and early impact of global warming, she said. "The pace of change is starting to outstrip our ability to keep up with it, in terms of our understanding of it," said Mark Serreze, senior scientist at the National Snow and Ice Data Center, a co-author of the Arctic amplification study.